Breaking Digital Gridlock empowers credit unions and community banks to make the shift to digital—even without a seven-figure consulting budget. From leadership, to technology, to security, and more, this book provides effective, real-world strategies for taking the leap without tearing your organization apart. With an emphasis on maintaining the culture, services, and features you have carefully crafted for your customers over the years, these strategies allow you to make your organization more resistant to digital disruption by adopting key technologies at key points in their evolution. Expert advice grounded in practicality shows how FinTech partnerships and strategic technology acquisition can foster new growth with minimal disruption, and how project management can be restructured to most effectively implement any digital solution and how to implement and leverage analytics. Specific implementation advice coupled with expert approaches offer the ability to modernize in an efficient, organized, financially-sound manner. The companion website features a digital readiness assessment that helps clarify the breadth and scope of the change, and serves as a progress check every step of the way. Access to digital assets helps smooth the path to implementation, and a reader forum facilitates the exchange of ideas, experiences, and advice. It is widely accepted that digital is the future of banking, but knowing is not the same as doing. If your organization has been riding the fence for too long amidst uncertainty and budget constraints, Breaking Digital Gridlock provides the solutions, strategies, and knowledge you need to begin moving forward. 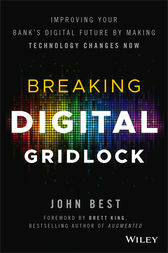 JOHN BEST is a thought leader recognized throughout the FinTech arena, with a particular affinity for credit unions. John is the founder and CEO of the financial technology firm, Best Innovation Group (BIG), which focuses on industry-wide code sharing and API prototype development. He speaks regularly at industry events, hosts a weekly FinTech podcast, and facilitates a highly interactive financial technology forum.